LTC JAMES E. REICHEL, passed peacefully, on July 23, 2015 at 12:09 pm, with his loving family surrounding him. James Reichel was born on January 5, 1935 on the family farm in Russellville, MO. The farm to this day remains in the family. He graduated from high school from Laura Speed Elliot High School, (Boonville High School) in 1952. He attended Kemper Military School and Junior College. He graduated with an Associates Arts Degree and then transferred to South West Missouri State College in Springfield, MO. He played football on the SMS college team and was a member of Kappa Alpha Order for over 50 years. 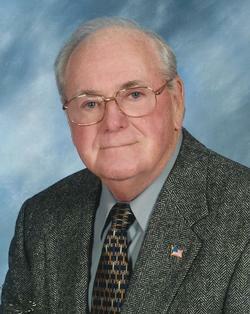 He graduated in 1956 with a Bachelor’s Degree in History and Social Studies, with a Teaching Certificate. Upon graduation he was commissioned a Second Lieutenant, United States Regular Army. He attended the Senior Reserve Officers Training Corp at SMS and entered the United States Army August 8, 1956. His overseas duties took him to Germany, 1959-1962. He had two tours of Viet Nam 1965-1966, and 1971-1972. He retired from the United States Army August 8, 1976, with the rank of Lt. Col. His Lt. Col insignia and rank was pinned by General Westmorland. During his distinguished military career he received the following awards and schools: Basic Infantry Course, Airborne and Ranger School. While attending Ranger School, Jim was in the major film production of Darby’s Rangers. He attended the Associate Military Police Academy, Military Police Officers Advanced Course, The Command and General Staff College in Fort Leavenworth, Kansas, and the Provost Marshal Military Police School. Col. Reichel was with the 82 Airborne Division during the Detroit and Washington D.C. Riots. He was respected by those in the military, his students and friends, forming many lasting relationships to this day. During his distinguished military career, he received the following awards: Legion of Merit, Army Commendation Medal (20LC), Meritorius Service Medal, Air Medal, National Defense Service Medal, Viet Nam Service Medal, Viet Nam Campaigne Medal, Air Medal, Viet Nam Counter Offensive Phase 1 and 2, Ranger Tab and Senior Parschitus Badge. After retirement he came to Natchitoches to organize and establish the first Junior Army Reserve Officers Training Corps Program, at Natchitoches Central High School. Under his direction, NCHS was named an Honor School in the first year in a three state region, Louisiana, Texas, and Mississippi. The Honors were awarded to the school for the next two years. During the annual inspection by III U.S. Army Corps officers from Fort Riley, Kansas other achievements were the formation of the Cavalier and Cavalettes Drill Team. The JROTC Rifle Marksmanship Team and the ROTC Orienteering Team also won awards for competition. Col. Reichel had the distinction of attending the Federal Bureau of Investigation National Academy, Instructors Course for Correctional Administrators at the American University Washington, D.C., and Law Enforcement Officers at Quantico, Virginia. He served as the Chief of Police of the City of Natchitoches, was a Criminal Justice Instructor at Fort Polk and Northwestern State University. He also taught for the Central Texas State College in Baumholder, Germany. He also served as the Director of the Caddo Detention Center, Sheriff Office, Keithville, LA. Col. Reichel is a member of First United Methodist Church of Natchitoches and belonged to many different organizations in which he holds membership: A Life Member of District 10 American Legion, served Voices of Democracy Chairman for many years, a member of American Legion Post #10, Commander, V.F.W. #1962 Commander, 6th V.F.W. District Commander for many years. He belonged and supported Gideon’s, Masonic Bodies: Phoenix Lodge #38 of Natchitoches and was a Master Mason for over 50 years, a member of York Rite, Scottish Rite Temple of Fort Leavenworth, Kansas, El Karuba Shrine, Shreveport, LA, and International Association of Chiefs of Police, American Corrections Association, Heroes of 1776 and Sojorners. Many a time you could find Jim participating in local theatre and church productions; “Arsenic and Old Lace”, “The Butler Did it Again”, “It’s a Wonderful Life”, The Last Supper” at First United Methodist Church, and “Louisiana Cavalier” at Grande Ecore Outdoor Theatre. Jim was also in the movie “Steel Magnolias” filmed in Natchitoches. He was preceded in death by his parents Archie. P. Reichel (California, MO.) and Gladys Irwin Reichel, (Russellville, MO.) his brother Norman Irwin Reichel (7/4/2015). He is survived by his loving wife Ethelene S. Reichel of 22 years, one daughter, Brenda K. Reichel and grandson James Keanu-Reichel of Honolulu, Hawaii. One Son, James E. Reichel II and his wife Susan, along with his granddaughters Ashley and Brittany Reichel of Boonville, MO. Loving step-daughters, Elizabeth B. Windham (Leslie Windham), Rhonda B. Kuhlmann (Lee Kuhlmann) and Sarah B. Maines (Tommy Maines). Additional grandchildren Zachary Kuhlmann, Jim Kuhlmann, Matthew Maines, Paula Geoghagan, Shannon Oberle, Melissa Maines, and seven step great grandchildren. Jim Reichel is also survived by his sister-in-law Tudie Reichel (Boonville MO. ), and brother, Norris and Barbara (wife) Reichel of Daytona Beach Shores, Florida. Services will be held at 2:00 pm on Sunday, July 26, 2015, at the First United Methodist Church of Natchitoches, LA, with Reverend Doug de Graffenried officiating. The family will receive friends from 1:00 pm until service time at the church on Sunday. Memorials may be made to Shriner’s Hospital in Shreveport, The Wounded Warrior Project, or any charity of your choice.